Q1 Should a person with diabetes fast? People who have their diabetes under control, either by diet or using tablets, may fast. However, their GP may require them to make changes to their medication in order to help them take tablets outside the times of fasting. Those who need insulin to control their diabetes are advised not to fast. Q2 I get severe migraines when I skip meals and they get worse when I fast. Should I fast at all? Those with uncontrolled migraines are advised not to fast. However, adequate control of migraines is possible for most people with medication and alterations to lifestyle, and hence such avenues should be exhausted prior to deciding not to fast. Please see your GP for further advice on better control of your migraines. Q3 Should a person with high or low blood pressure fast? Those with well-controlled high blood pressure may fast with lifestyle alterations and/or medication. Their GP may require a change to their medication in order to help them take tablets outside the times of fasting. A person with so-called ‘low blood pressure’ who is otherwise well and healthy may fast. An adequate intake of fluid and salts in the diet is advised. Q4 Is fasting harmful when a woman is expecting a baby? Is it compulsory to fast while pregnant? It is not compulsory to fast while pregnant, but the woman will either need to make up those fasts later or, if unable to do this, should perform fidyah *. There is some medical evidence to show that fasting in pregnancy is not advisable. If a pregnant woman feels strong and healthy enough to fast, especially during the early part of the pregnancy, she may do so. If she does not feel well enough to fast, Islamic law gives her clear permission not to fast, and to make up the missed fasts later. Q5 Is Ramadan a good time to quit smoking? Yes. Smoking is wasteful and seriously injurious to health. Allah has entrusted us with a healthy body, and it is a violation to knowingly and willingly harm it. Ramadan provides a great opportunity to amend many bad habits, and smoking is very definitely one of them. Q6 From what age can children fast safely? Q7 Can I use an asthma puffer during Ramadan? Muslim jurists differ on this issue. Some leading jurists argue that using an asthma inhaler is not classified as eating or drinking, and is therefore permissible during fasting. Others argue that because the inhaler provides small amounts of liquid medicine to the lungs, it breaks the fast. Perhaps the former view is stronger, since the inhaler assists with breathing and helps the person to fast, which means abstaining from food and drink. According to the first view, asthmatics may fast and use their inhalers whenever required during fasting. According to the second view, asthmatics with poor control of their disease are advised not to fast until good control is achieved. Others may alter their inhalers to those of a longer-acting variety so that fasting may be feasible. Please see your GP for further advice. Q8 Can I swim during fasting? Yes, but do not drink the water. Having a bath or shower or swimming has no effect on the fast. Clearly, no water should be swallowed during any of these activities, for that would break the fast. Q9 Can a person fast if they are getting a blood transfusion in hospital? Q10 I am on regular medication. Can I still fast? If such medication needs to be taken during the time of fasting, you should not fast. If this medication is required as treatment for a short illness, you can compensate for missed fasts by fasting on other days when you are well. If medication is required on a long-term basis as part of an ongoing illness or condition such as high blood pressure or diabetes, then you may discuss with your GP whether to change your medication to a long- or short-acting variety as appropriate, to enable you to take it outside the time of the fast. If your disease is unstable or poorly controlled, you are advised not to fast.Those who are unable to compensate later for missed fasts, due to the long-term use of medication, are advised to do fidyah *. Q11 Does a breastfeeding woman have to fast? No. Islamic law exempts a breastfeeding mother from fasting. Missed fasts will need to be compensated for by fasting or fidyah * once breastfeeding has ceased. 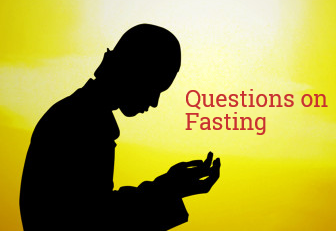 Q12 Can a Muslim patient take tablets, injections, inhalers or patches while fasting? Taking tablets invalidates the fast. However, injections, inhalers, patches, ear and eye drops, etc that are not comparable to food and drink do not break the fast, although it is advisable to avoid these if possible due to the difference of opinion among Muslim jurists on these issues. Islamic law exempts the sick from fasting. Please see the answer to Q10 for further details. Q13 Could dehydration become so severe that one has to break the fast? Yes. Harmful levels of water loss could occur if the person was poorly hydrated before commencing the fast, and/or could be made worse by activities during the day and weather conditions. If one produces very little or no urine, feels disorientated and confused, or faints due to dehydration, the fast should be broken in order to rehydrate oneself. Islam does not require that you harm yourself in fulfilling the fast. If a fast is broken, it will need to be compensated for by fasting at a later date. Q14 Can I fast while I have dialysis?